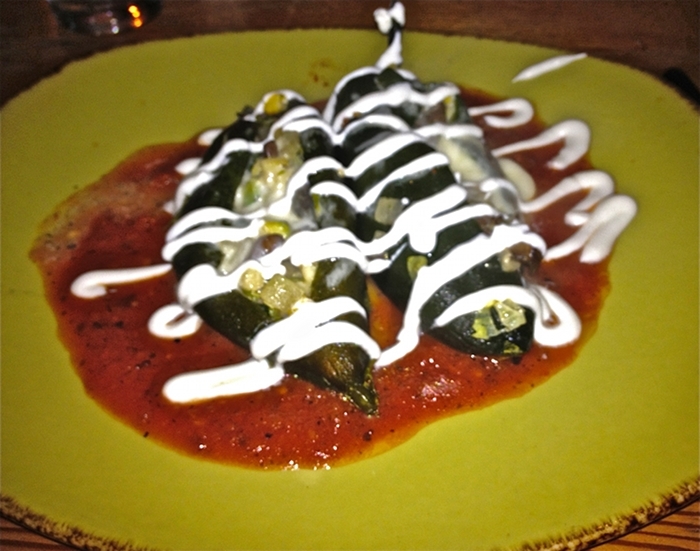 We wanted pizza and thus finding ourselves on Divisadero in the Lower Haight why not check out Ragazza. It's been open for awhile now and gotten lots of good press so why not. It's run by the same folks who own Gialina in Glen Park, a place I've been to some time ago but remember vaguely enjoying it back then. When we get there the place is crowded and we didn't make reservations which doesn't really matter since it's one of those places where they don't take them and you have to wait. I don't mind a small wait, 30 minutes or so, but an hour, no frickin' way. Fortunately you can get their pies to go which is exactly what we did. We had some friends pop into town this past weekend for an overnighter and decided to go out for a quick bite to eat. Since it was raining we thought we would stay close to where we live and decided to hit up Tres just across the street. We had not been there since they changed from being Tres Agave to being just Tres Tequila Lounge and Mexican Kitchen. I'm just going to say right off the bat about this place that for what you get it's pricey, especially so for Mexican food. They do bring you chips and two kinds of salsa, one spicy red the other a mild green which was tasty. One of our guests ordered some guacamole which they brought in one of those stone mortar bowls and this will set you back $8.50 for a basic guac dip. I wasn't all that hungry so decided to go with the Chiles Rellenos con Huitlacoche--poblano chiles filled with 3 cheeses, white corn, beans and Mexican truffle. 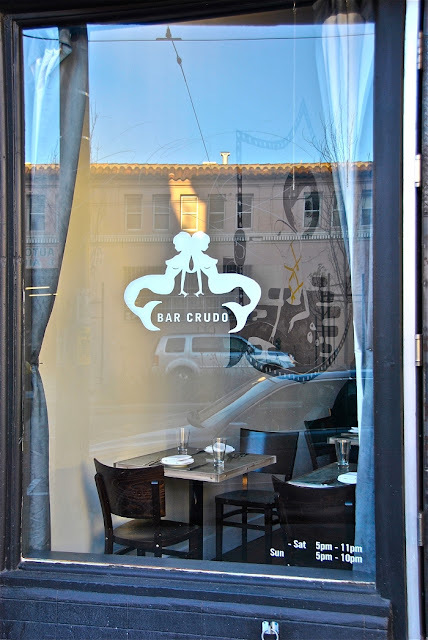 Located in the up and coming new hipster neighborhood growing along Divisidero Street which is either the Western Addition or Lower Haight (depending on who you ask) is Bar Crudo, a place I'd heard of but never gotten around to going to, even though I used to live only a few blocks away. A co-worker recently was having a birthday and this is one of her favorite spots so some of us from work took her there, giving me a chance to see what it was like. We only went for the happy hour so this is a short review but from what I had, it's also a good review.